Over the last 50 years, the world-renowned Black Uhuru (Swahili for freedom) accumulated several accolades including a Grammy-award for Best Reggae Recording, six Grammy nominations in three separate categories, and dozens of chart-topping hit songs. To say this band has maintained an active performance career would be an understatement. Their historical trajectory as a band is phenomenal by itself. Moreover, the release of their latest album, As The World Turns, continues their longevity while paying tribute to the legacy of reggae. To understand the historical significance of Uhuru, one must examine the remarkable robustness, influence, and prominent contributors of this ensemble. Founded by Simpson in Kingston’s “Waterhouse” District in the late 1960s, Uhuru’s earlier formations included former members Don Carlos, Garth Dennis, Sly Dunbar (drums), Robbie Shakespeare (bass), Junior Reid, Michael Rose, and Puma Jones, among other artists. The current configuration on As The World Turns includes Leebert “Gibby” Morrison (guitar), King “Lion” Hopeton (keyboard), and Nikki Burt (vocalist), Phanso Wilson (drums), and others, all of whom maintain successful music careers. The album also features artists Agent Sasco, Bugle, and Prezident Brown. This collection of personnel might seem like a long list of names, but for a true fan of reggae, dub, and dancehall music, these figures highlight historical trajectories, influences, and connections within the reggae music industry. 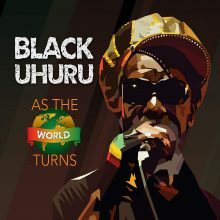 The album opens with title track “As the World Turns” with front-man Simpson’s vocal’s leading the celebratory procession, signaling the return of Uhuru with their newest project. Beginning with dynamic bright brass and synth sounds, this track emits a lively energetic feeling that sets the tone for the entire album, teasing the listener with a brief dub reggae interlude. The following track, “Spectrum,” maintains the same vibrancy, but now in full-blown reggae dub riddim, along with lush vocal harmonies, bright rhythmic brass hits, coupled with a captivating bass line. Switching to more socio-political commentary, “Stronger,” written by Jojo Mac, features Sasco. This track expresses Uhuru’s dedication to injustice, announcing their roles as “soldiers of freedom, and freedom fighters,” using their platform to combat the political oppression. Although this and other songs—“War Crime” and “Chalice”—articulate the social consciousness associated with the rhetoric of Uhuru, As The World Turns also honors the legacies of several prominent reggae artists. Remembering legend Bob Marley, Uhuru performs a beautiful rendition of “Stand Alone,” and their version of “African Herbman” called “Jamaican Herbman.” Reflecting on Peter Tosh’s influence, they perform an outstanding rendering of “Jah Guide,” featuring the vocal prowess of Bugle. In homage to the illustrious falsetto singer Junior Murvin, Uhuru present an up-tempo version of his classic hit “Police and Thief,” which was named the “Reggae Single of the Year” by Black Echoes. Based on the multiple influences heard on this album, we can see why Black Uhuru has been deemed the “ambassadors of reggae music” and cultural bearers of Jamaican music. Their music continues to strengthen, inspire, and uplift Jamaican people and culture, and contributes to the proliferation of Jamaican roots reggae, and its iterations, to the global audience. It is for this reason As The World Turns serves as a phenomenal exemplar of Jamaican musical legacies and continuity. 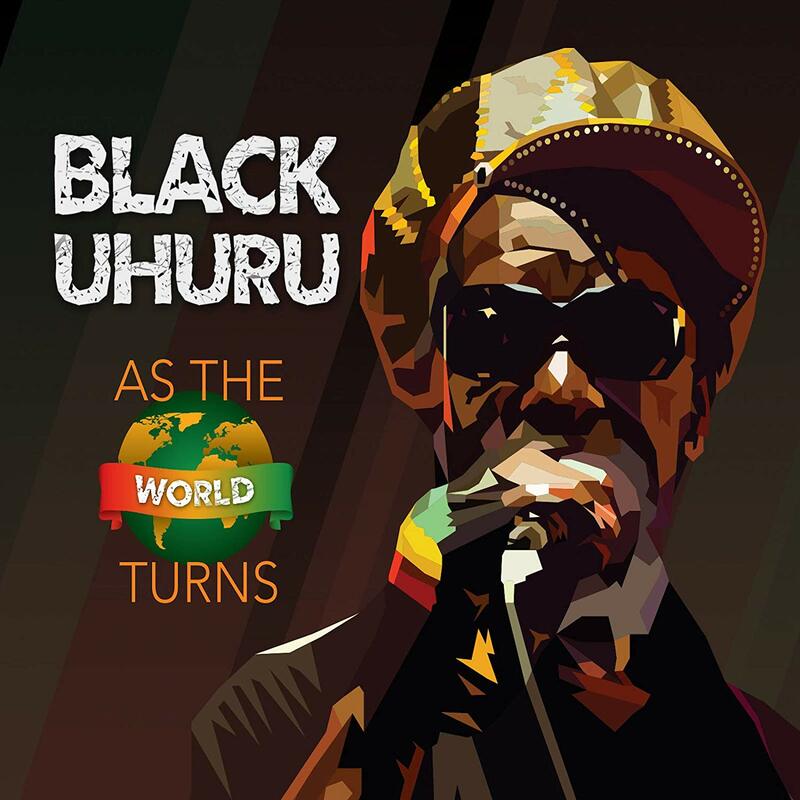 This entry was posted in Reggae and tagged As The World Turns, Black Uhuru, Black Uhuru Official, CD review, Jamaal Baptiste, Reggae by aaamc. Bookmark the permalink.